Chicken curry and rice was a Sunday afternoon ritual while growing up in Calcutta. 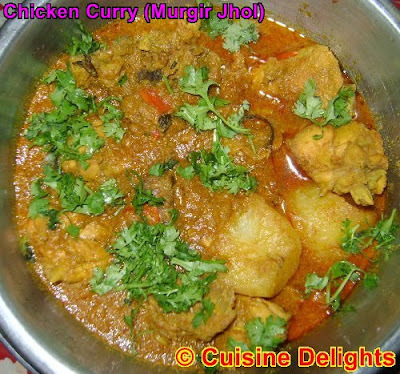 I make a simple chicken curry or murgir jhol as we say in Bengali..
Heat musturd oil in a deep heavy bottomed pan, fry potates. In the same oil add bay leaves, then add roughly chopped onion and fry till the onions turn deep maroon & golden with deep brown. Add ginger-garlic paste and tomatoes, fry until tomatoes are smashy. Now add turmeric powder, red chilli powder, coriander powder, salt and sugar. Stir and fry the masala adding a bit of water from time to time. As soon as oil starts to separate add a little water. Add the chicken and on medium heat cook it stirring occasionally. Do not add water so that chicken pieces get slightly fried in the process. After another 4-5 mins add about 2 cups of water. Stir, add the green chillies. You may make a slit in them if you would like a little hot gravy.Add the fried potatoes as well. Cover with lid and simmer until the chicken is soft and well done. Also ensure the potatoes are cooked. Check seasoning and the salt, garam masala. Some fresh coriander leaves sprikle on curry. Serve hot with steaming hot rice. It’s lovely to have some very hot rice with some even more hot murgir jhol.